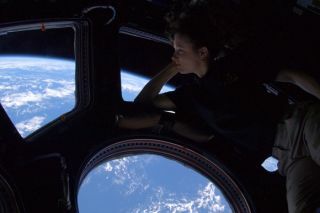 Douglas H. Wheelock, "Astro_Wheels" on Twitter, shared this picture of Astronaut Tracy Caldwell Dyson looking down on Earth from the cupola of the International Space Station. NASA is joining in on the celebration of Earth Day 2011 tomorrow (April 22), with a variety of online activities that highlight the agency's involvement in Earth science and the protection and preservation of our home planet. Ames Research Center in Mountain View, Calif., from Wednesday to Friday (April 20 to 22) from 3:30-4:30 p.m. PDT, employees can tour the "Sustainability Base," a new facility that has re-purposed NASA technology designed for closed-loop systems in space. The project is a candidate for the platinum-plus rating by the internationally recognized LEED (Leadership in Energy and Environmental Design) green building certification system. More details on NASA's Earth Day activities can be found here.